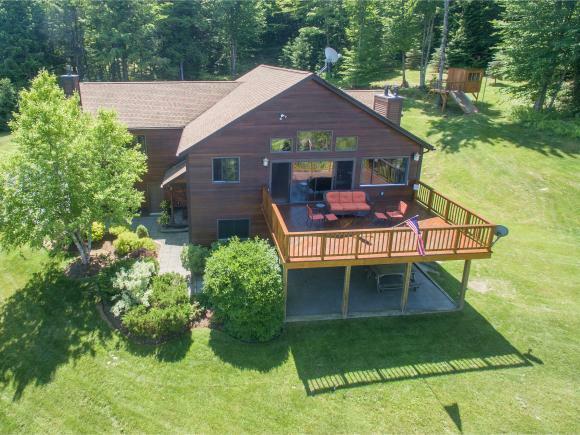 Private Mountain Retreat; Move right in to this designer-decorated, two-story mountain home, in a private residential neighborhood with fabulous views of Mount Mansfield! Just minutes from Stowe Village, ski trails and hiking, this home is well designed with a spacious open floor plan, perfect for hosting large family gatherings or overnight guests. The welcoming entrance foyer leads one flight up to the great room kitchen/dining area with cathedral ceilings, gas fireplace with stone surround and sliders out to the over sized deck......perfect for year round or vacation home. The master bedroom suite features a palladium window, large walk in closet, romantic gas fireplace and large bath with Jacuzzi tub and shower. There is a Junior Master suite to round out this upper level. The lower level has two family bedrooms set up as girl&apos;s and boy&apos;s bunk rooms with a shared bath on one side and a cozy game room with wet bar, pool table/Ping Pong and wood burning stove on the other. Doors out lead to the manicured yard complete with sledding hill and tree house with snow boarding ramp. A must see! Other features: Two-car attached, heated garage, Nest Thermostat, whole house water filtration system.